Hello :) I know April is not "technically" over yet, but I am going to review the month today as I am sure this week is going to fly by and then we will be into May! April has been a busy month, they all seem to be busy around here though. We had one birthday in the fam, which was my dad's .. so of course..we had cake :) Vanilla cake with vanilla buttercream icing turned into this shaggy green golf cake :) Inspired by the talented Lyndsay from CoCo Cupcakes ! ---> Check out her blog if you get a chance, sooo awesome! I had a pretty productive day as I was in the "zone". The kids went swimming with Grandma, my hubby had a lazy sunday, and I sewed. But this is the pile that I am up against. I try to make rules for myself. But no matter where I go, I find socks! So for the next couple of days I will be settling in each night to finish up this bucket. These monsters are all ready to go, they have arms and mouths, and just need faces :) I picked up the first season of Glee to keep me occupied while I sew. Monsters LOVE to sing, so they figured this would be perfect! Aside from monsters, I am still of course crocheting. I LOVE crochet, and can't seem to get enough of it! Right now I am working on an "African Flower" pattern which I found on Flicker, by Elizabeth Cat. 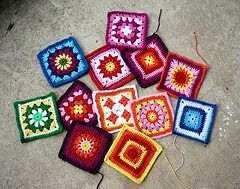 And also.. random different granny squares. As I was cruising through flickrville I came across a "SIBOL" project, and thought.. what a cool idea! So I am hoping to pitch in for that as well.